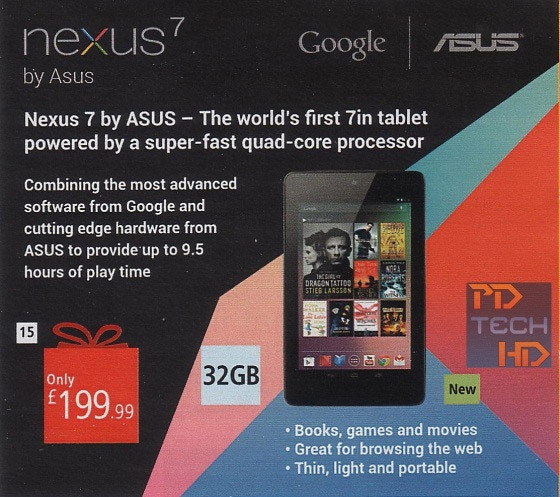 The 32GB flavor of the Google Nexus 7 tablet has been spotted yet again, this time on a store’s brochure. Just as before, the 32GB model is said to cost as much as the 16GB Nexus 7 currently, further solidifying the rumors of it being replaced. But how soon, you ask? According to The Next Web, and its source we shouldn’t expect the 32GB model to launch in the next two weeks. Still not convinced? The new 32GB flavor of the Nexus 7 has made yet another appearance at the Staples Advantage store, carrying a price tag of $248 (two dollars less than the $250 Google is asking for the 16GB model). The store has listed October 18 as availability date, but we’re inclined to believe this is just a placeholder. Furthermore, upon checkout with his brand new 16GB Nexus 7 at an yet undisclosed Netherlands online store, Reddit user kingdaan was told that his order will be delayed by three weeks and that he’ll receive a 32GB Nexus 7 instead. I recon it’s worth the wait.